Heres a question for you. Would it be possible to run a team poker game on Tournament Director? 16 teams of 5 players each. 80 players in total. The final 40 players will be awarded points for their individual finishing position, your score increase by 1 point. So that eventually 1st place will get 40 points. The prize pool would be easy to do. Just adding a manual prize for the team game. (The prize pool is known in advance). Awarding the points would be easy. Just the basic formula. But its adding the points for each team together that i think would be a problem. To be honest i have no idea of where or how to start. What i would like to do is to be able to display (in real time) the running totals (on a separate screen), for all the different teams as and when the points are awarded. On the screen would be displayed. A separate box for each team, which would include,The names, position finished and the points that each player in that team has earned (if any). But also displayed on the screen would be a list of what points are still to win. I have thought about making 16 new leagues: Calling each league:- Team A, Team B, Team C and so on. Do you think this would be possible to do? And if it could, could you point me in the right direction, give me some ideas of how or even if this can be done. Any comments or suggestions both good or bad would be very welcome. I cannot think of a way to display point sums from different players. There just isn't any way in the software to do that. team events are difficult with software. For example when doing seating draws you would seat the players and then once everyone is seated you have to manually move team members to ensure it is balanced correctly with not too many players at the same table from one team. I haven't seen any software yet that can handle team events without manual intervention. First of all thanks for reading the thread. I had read a lot of past threads and though the subject had been broached there did not appear to be any solutions to what i had asked. So I thought it would be worth asking the question may be from a different slant. I do realise that what would be needed wouldn't be a simple solution. And i imagine that to implement this would be a major job. TD is a great program as it stands, its only by making suggestions and getting peoples thoughts and comments that you can learn what can and can't be done. How about making the "Team Game Query" a suggestion for some future version of TD. 1, In the tables tab in the unseated players section. When you select a player. If you right click on the players name, you could have a drop down list where you could select what colour the name and background could be displayed in. i.e. if you have 5 players in a team you could make the font red the back ground yellow. another team could would be displayed in Blue with a red background etc. This might assist the operator to ensure that different team players don't end up on the same table. You could see at a glance what teams are sitting where. And this would assist the operator when making manual movements. 2, Maybe in some future version a way could found to total up the points of players in a team. Could there be away for TD to export the points to an excell spreadsheet and then for TD to display that spreadsheet result onto a screen in TD? Whether it would be possible to run both programs together and have both programs updating the other simultaneously would I imagine need looking at. Thats way past my knowledge. You are correct that a spreadsheet can be displayed in TD. However, as I learned, it cannot be in its original file format. If you save it as htm or html and iframe it, the you would be able to view it. I use this to show the points going into the night's game a bit easier than what TD shows. Just out of pure curiosity, doesn't having "teams" inherently encourage subtle, if not outright, collusion? LOL it has been known. Just have to be very careful especially when the tables condense. One way of avoiding any "difficulties" is that if anyone on the same team are in the same hand, both must show there face up cards in a showdown. Also the tournament director has the right to see any hand. For instance if one team member raises and another team member reraises, and the first raiser folds his hand, the TD can see the hands to make sure there is no chip dumping. I have found it makes the game a lot tighter when team members are on the same table. I have found that team games to be more of a social occasion rather than a serious poker game. Players play for the bragging right. The last one i was in a lot of players eliminated early were staying behind to rail their team members. At the final table there were over 80 people railing the FT. 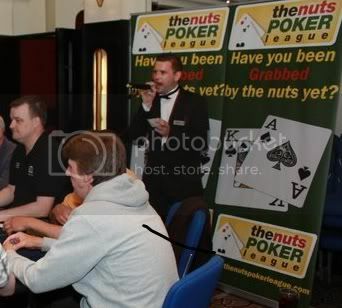 It was £30 a head with 160 runners and the casino added £1500 to the pot. a good game. I finished 19th and my team were 5th. A good day and night out. loads of drink and some good banter. I could see how it (collusion) could be made into part of the fun, as well. As long as the tournament is played that way. With money involved, some people have a harder time seeing just the "fun" of it.